After you pour the foam, you have to remove the plaster mold.Â This is more complicated than it looks, since some of the plaster will stick to the form.Â Removing this involves a chisel, a rasp, and lots of patience.Â (Lots of patience. )Â Once the mold is removed, you have to cut a wooden base for it, mount the base, and make the stand.Â After mounting the form to a stand, you then have to rasp/sand it down until it reaches the correct dimensions.Â (Because you breathe during the making of the mold, it’s going to be slightly bigger than it should be. )Â Finally, you have to sew the cover. All in all, a highly time-consuming process, but the dress deserves nothing less. First, I have confirmation from someone who is willing to wind skeins of silk for dye samples for me.Â This is tremendously exciting, as I’ve said before, and I’m starting to look through various manufacturers’ dye colors to see which new primaries I want to try. I took the dress in for appraisal on Sunday, and should get the results back today.Â The appraiser (former textiles curator for the DeYoung Museum) said the workmanship was excellent, and the ensemble was exquisite (! ).Â Now I just need to get the final number so I can get insurance.Â I’m expecting it to come in around $30K, but the real value (of course) is “priceless”. I’m probably going to donate both dress and coat to a museum sometime after the wedding and all the weaving exhibits are over.Â (I’m not planning on having kids and I refuse to let it go to a garage sale when I die! )Â Melissa (the appraiser) suggested either the San Jose Museum of Quilts and Textiles or the Oakland Museum, and I’ll contact them in a couple of months, after all the weaving and fiber exhibits are done. May I present to you the result of much work this afternoon? Mike wraps me in wet plaster bandage. Before it sets completely, cut up center front and center back.Â Remove cast. Let cast dry for a couple of days. Using a tapestry needle and button/upholstery thread, sew the two halves of the cast together. “Tape” together the sewn edges using more plaster bandage, first perpendicular to and then parallel to the cuts. Seal up the armholes with more plaster bandage. Through the neck and bottom openings, smear the entire inside cavity with paste wax (as a mold release agent). And voila! the sculpture you see above. Tomorrow I’ll start pouring the foam.Â This is 3-pound foam, so one cubic foot weighs 3 pounds.Â I have a two-gallon kit of foam, which should be plenty for two dress forms.Â I probably won’t finish pouring foam until Saturday, though – you have to do the stuff in layers – and after that, I’ll remove it from the plaster mold (hopefully not damaging it too much in the process), sand/rasp down the dress form to the correct measurements, and mount it on the stand.Â There are actually more steps, but I’m omitting them for the sake of brevity…I expect this project to take up a good chunk of the weekend. Wedding-dress-wise, I’ve sewn together and finished all the seams of the second lining.Â Tomorrow morning and/or Saturday, I’m going to sew on the pearls, and then on Sunday I’m going off to Sharon’s again, so we can work on dress and coat together. Today I had Mike transform me into a plaster mummy, covering me with wet, rapidly-hardening plaster bandages until I was in a full-body cast from neck to mid-thigh. No, I don’t have a plaster fetish.Â (Really. 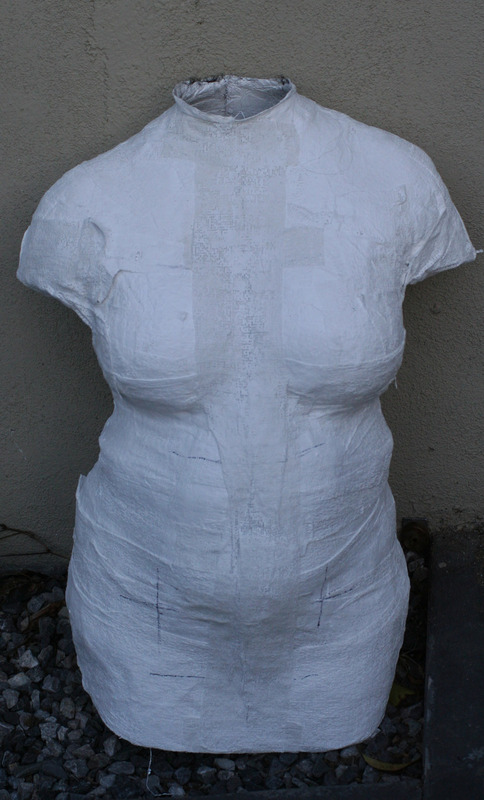 )Â Instead, we were preparing to cast a dress form using the instructions in the My Twin Dressform manual.Â First you make a plaster cast of your torso and let it dry.Â Then you fill the plaster cast with plastic resin foam, and presto! a Fantastic Plastic Person. No, seriously.Â I will need to display both coat and dress, so I’m making two dress forms.Â For display purposes, I’m going to cover them in black stretch velvet for maximum visual impact.Â After that, when they become “working” forms, I’ll cover them in something less dramatic, like a rib knit. Other than that, it was a fairly uneventful day.Â I finished sewing down the back lace, and sewed down the pearls around the neck edge of the bodice.Â I had exactly as many pearls as were needed to complete the neck edge – good thing I didn’t lose any more of them!Â I will use the new pearls on the body of the sleeves, and on the back of the dress.Â I don’t think the difference will be noticeable there. I also finished hemming both sleeves, and started clipping the too-tight stitches out of the hem.Â Tomorrow morning I’ll go at it in earnest, to see what can be saved.Â Redoing one row of stitches will cost me about three hours, which is about 2/3 of a weekday’s work – annoying, but not nearly as disastrous as I was thinking earlier.Â So hopefully I can get the hem fixed tomorrow.Â That will free me to work on the second lining the rest of the week. At any rate, the rapid sweep of time means I need to start thinking about designing the invitations.Â I figure I can do that in my spare time, when I’m sick of working on the dress.